PHOENIX – Arizona Department of Transportation maintenance crews are continuing pavement repairs along northern Arizona highways after winter storms. Next week, crews will lay asphalt over existing pavement to smooth sections of Interstate 40 at milepost 156 westbound and continue this work between mileposts 169 and 172 eastbound, about 10 miles east of Williams. 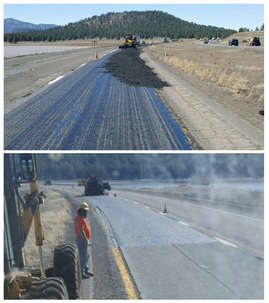 Patch work and asphalt overlays also will continue on State Route 89A in Oak Creek Canyon. Potholes can pop up quickly when moisture seeps into and below asphalt, which in northern Arizona can be stressed by the combination of freezing overnight temperatures and daytime thawing. The Flagstaff area usually experiences more than 200 daily freeze-thaw cycles each year. Add heavy traffic, and this stressed pavement can break away. ADOT has two projects coming later this year along I-40 between Flagstaff and Williams that will add a new layer of pavement in both directions.